The purpose of this book is to introduce the sociology of law by providing a coherent organization to the general body of literature in that field. As such, the text gives a comprehensive overview of theoretical sociology of law. It deals with the broad expanse of the field and covers a vast amount of intellectual terrain. This volume is intended to fill a gap in the literature. Most textbooks in the sociology of law are insufficiently theoretical or else do not provide a paradigmatic analysis of sociological theories. 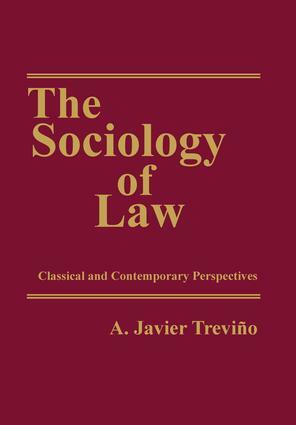 The content of this text consists of discussions of the works of scholars who have contributed the most to the cumulative development of the sociology of law. It surveys the major traditions of legal sociology but is not wedded to any one particular theoretical approach. Both the "classical," or nineteenth-century, and "contemporary," or twentieth-century, perspectives are covered. The reader will see that nineteenth-century thought has directly influenced the emergence of twentieth-century theory. One unique feature of this book is that key sociological and legal concepts, presented in bold print and italics, are defined, described, and illustrated throughout. Although the nature of the subject matter is highly theoretical and, at times, quite complex, Trevino values every effort to present the material in the most straightforward and intelligible form possible without compromising the integrity of the theories themselves. In short, this book aims to accomplish three objectives: inform about the progressive advancement of sociological theory, teach the reader to analyze the law as a social phenomenon, and develop in the reader a critical mode of thinking about issues relevant to the relationship between law and society.